While they received some initial bad press because of one manufacturer’s poor quality control, fiberglass LP tanks continue to gain popularity, and with good reason. Among other things, they are lighter than metal tanks, they are corrosion-proof, and they are translucent, making it possible to determine how much LPG remains. When surveying vessels with LP systems, I routinely encounter LP tank lockers with vertical hatches. While they may be part of the vessel’s overall design, and thus not easily modified, these hatches immediately disqualify the installations from American Boat & Yacht Council compliance. Unfortunately, violations and safety issues in LP systems are common. While it’s impractical to memorize every ABYC Standard, it’s well worth gaining at least a working knowledge of A-1 “Marine Liquefied Petroleum Gas (LPG) Systems.” Your customers’ lives may depend upon that knowledge, and by incorporating the following highlights, you should carry out at least a cursory inspection of onboard LP systems. LP tanks must be installed either on deck or in a dedicated locker. On-deck installations must be secured for any sea state and protected from rain and spray (a fitted, secure canvas cover meets this requirement). Regulators and valves must be a minimum of 20” (0.5m) from any opening into the vessel’s cabin or hull interior. An opening may include a hatch, a port, a dorade, or a solar vent—essentially any orifice that can allow LP gas, which is heavier than air and thus settles, into the boat. Instead of the vertical hatches mentioned above, LP tank lockers must open from the top. They must also be located above the static waterline and be vaportight, and the hatch lid must have a gasket and be securely latched. Ideally, the lid should open directly to the atmosphere. If that’s not possible (say, the LP locker is in a lazarette), then its lid should be as close to the hatch opening as possible. An improperly stored LP tank is an all too common sight. All LP tanks, regardless of whether or not they are in use, fall under the same storage requirements. The vent and drain for the locker must be installed at the lowest portion of the LP containment locker; it must not trap water and must be located, once again, above the static waterline and 20″ or more from any opening into the hull (an opening hull portlight, for instance). The locker must store only LP tanks. This is also true for spare tanks, which means they may not be kept in sail lockers, lazarettes, or the cabin. If the pressure builds within LP tanks as a result of elevated temperature, they can vent gas to avoid rupture. Additionally, tanks without OPD valves (see below for more on this) can leak gas from the valve if it is inadvertently turned, which can easily happen in a conventional storage locker. Each installation should include a pressure gauge. Contrary to popular belief, this gauge does not indicate the quantity of gas in the tank. Because LP boils to maintain equilibrium within the pressurized tank, the pressure remains constant until the tank is virtually empty. Instead, the gauge detects leaks. 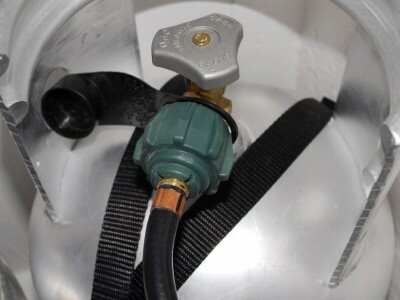 To test for leaks, follow this procedure: With all appliances off, open the LP tank’s valve for a few seconds (if a remote solenoid is installed, it should be open or on as well). Note the gauge’s pressure, then close only the valve on the tank. The gauge, which is reading pressure within the line from the tank to the appliance, should maintain its reading for a minimum of 5 minutes. If pressure drops, a leak is present, and the system should not be used until the leak is located and repaired. With very few exceptions, ABYC standards clearly call for LP gas connections to be contained within the storage locker. The valve shown here, located outside a locker, violates that protocol. Lines that carry LP from the locker to appliances, stoves, heaters, etc. should also be closely inspected. Each appliance must have a separate, continuous line, either purpose-made flexible LP gas hose that complies with UL standard 21, or annealed Type K or L copper tubing with a minimum wall thickness of 0.032″ (0.813mm). No joints, Ts, valves, unions, or connections are permitted outside the LP locker, other than where a transition is made between copper tubing and the required length of flexible hose at a gimbaled stove. It’s not uncommon to find manual valves installed in an LP line at or near stoves; this is a clear violation of the standard. Terminations for flexible hose must be permanent swaged or sleeve and threaded insert fittings; hose clamps are not acceptable. All copper tubing terminations must utilize long rather than short nut flare fittings; the latter are commonly used on refrigeration systems. While it’s not specifically an LP issue, ensure that the gimballed mounts for stoves are fully captive. Test this by vigorously lifting up on the stove. If it unships, the mounts are faulty and must be modified or replaced. 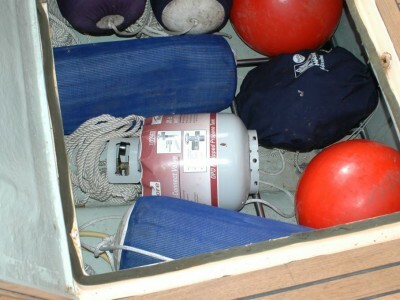 Of course, every vessel equipped with an LP gas system should also have LP gas and carbon monoxide sensors/alarms. LP tanks are adorned with a variety of letter and number designations. Understanding (most of) them is important. WCW (water capacity weight) is the weight of the cylinder when filled with water. Since LP gas is about four-tenths the weight of water, determining the capacity of a cylinder requires only a little arithmetic (multiply by 0.42). One of the most common LP gas cylinder sizes, 20 lbs, has a WCW designation of 48. TW (tare weight) is the weight of the empty tank. If you were to weigh your LP gas cylinder, anything over the TW is LP gas. Most important is the date code, which indicates when the cylinder was manufactured: for example, 8–99 or 12–03. Department of Transportation (DOT) regulations require that metal cylinders be “requalified,” which means the tank must undergo either a hydrostatic test or a visual inspection by a qualified LP service facility within 12 years of that date. After 12 years, the tank may be re-hydrostatically tested, at which point it will be stamped with a new date, renewing its 12-year inspection interval; or, a visual inspection may be performed. The latter will provide a 5- rather than 12-year inspection period, and it is indicated by the letter E stamped after the previously expired manufacture date. 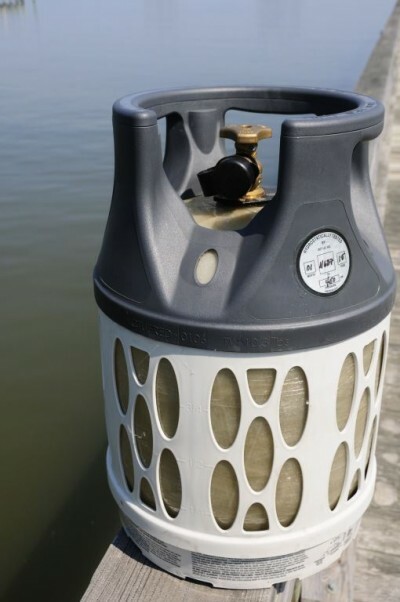 The requirement for overfilling-prevention devices, or OPDs, on all new portable LP cylinders with capacities between 4 lbs and 40 lbs, beginning in October 1998, is probably old news to most of the marine industry. Not widely known, however, is that several other safety measures were concurrent with the introduction of the OPD. The new OPD valves, in addition to being overfill-proof, incorporate a positive-seal mechanism that prevents gas from free flowing unless a hose is positively attached (eliminating the aforementioned possibility of a leak when a valve knob is bumped or jarred open). Current valves also utilize an external right-hand Acme thread, which is not only easier to use but also works with the new plastic couplings designed to melt and shut off the flow of gas in the event of a fire. Overfill prevention devices or valves have made LP tanks safer. They also incorporate a hand wheel attachment design that eliminates the need for tools, reducing the likelihood of leaks that result from improper plumbing installation. OPD valves are also equipped with an excess-flow feature. 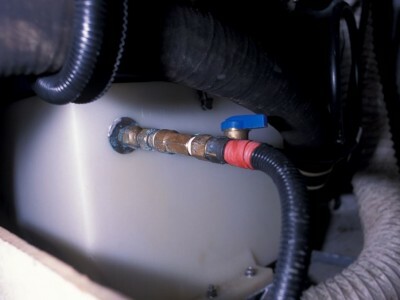 This will prevent gas from flowing out of the cylinder in the event of a catastrophic break in a supply hose or pipe. For example, if the LP supply line were to be completely severed by a 40-lb anchor dropped on a copper tube, or a rubber hose melted during a fire, the gas would flow at a much higher rate than normal. The new-style valve will sense this and, in theory, stop the flow almost immediately. Finally, no discussion of LP gas systems would be complete without mentioning fiberglass tanks. They offer several advantages, the greatest being their corrosion resistance and translucency, making it easier to determine the fuel level. One of the initial manufacturers, The Lite Cylinder Company, experienced some tank failures and subsequently issued a recall and filed for Chapter 11. Any tank supplied by this manufacturer should be immediately and permanently removed from service (the manufacturer is bankrupt, so there is no replacement provision). Fiberglass tanks from other manufacturers are not affected by this recall.